My client manages her own massage business, DeHart Bodywork. She both practices massage as well as contracts with other practitioners to work out of her business. About half of her bookings occur through her website, but it has not been updated in several years. Promote her massage business through an updated website that encompasses usability best practices, keeping in mind the constraints of a small business with a sole proprietor. Using a clear and consistent content strategy, layout, and minimal design, I reflected the business' goals for clarity and connection by creating a website that allows customers to easily navigate and locate desired information to book massage service. My client is the owner of DeHart Bodywork, where she manages all aspects of her business. She and I worked together throughout our engagement. Initially, she requested an updated website, but I soon realized she also needed a system in place and templates available so she could easily and quickly make website changes or additions to her website on her own. Working with my client, we determined using a survey would be the best place to start gathering feedback from her customers, since she doesn't see them all the time, but has their email addresses. To better understand why DeHart Bodywork customers schedule a massage, we asked responders to rate different statements about what motivates them to book a session. While drafting the survey, my client and I discussed typical motivations for getting massage (relaxation, stress release, pictured below in Group A) as well as reasons specific to DeHart Bodywork's mission (connection to one's body, pictured below in Group B). To better understand why people schedule a massage, we asked responders to rate statements based on relevance to them. "[She] focused on my shoulder, which had recent sports PT work on it." "The effectiveness of the therapy in pain relief." "I was able to go to a really deep place of relaxation." My client was surprised to find that most responders leaned heavily towards booking massage sessions based on more typical or commonly known motivations for receiving a massage (Group A). We discussed how using language associated with relaxation, pain and stress relief in communications or promotions may be more effective at relating to her customer's needs. I also considered whether the Group B statements may not have correctly expressed my client's mission. If we had time to dig deeper, I would schedule interviews with previous customers to better understand their motivations. The survey shouldn't be too long (or have the appearance of being too long). The initial survey had many conditional questions, and based on my client's knowledge of her customers, most would not have needed to answer each question (for example, not everyone had received a massage from every practitioner). Regardless, at the bottom of the first page of the survey, it showed 8% complete. Only 8%! That gave the impression that there were pages and pages to go. I didn't even want to complete it! Make the call to action and the benefit to the responder clear. The initial survey was sent in an email with several other topics and updates, so we hypothesized it may have been lost in the noise of the other content. Also, the benefit to the participant (i.e., what do they get out of it besides the kindness in their heart) wasn't as explicit or enticing. For the second the version of the survey, I shortened it to be one page long with fewer total questions (and no conditional questions). The survey was emailed explicitly requesting feedback and a prominent and enticing discount was offered for a future massage service. With these focused changes, I was able to boost the response rate up to 4%. One area I reviewed was the number of options available for booking a service. There were 35 different services offered in 6 subcategories. After reviewing the most frequently selected services, I found the first few options in the list were chosen far above the other options further down the list. Some never having been selected at all. As Nielsen Norman Group states, "simplicity wins over abundance of choice." We narrowed down the list to 17 options, separated into 5 subcategories. A before and after visualization picturing the quantity of massage and bodywork services for a user to select from. By paring down the choices, customers will have fewer options to navigate, making it easier for them to decide without fear of missing a better option, discouragement at feeling overwhelmed, or confusion about duplicate listings. Before, the practitioner pages had no consistency in what information as displayed or how it was laid out. After, the information is broken into sections (About Me, Specialties, Trainings & Certifications) in a clear and consistent layout. I created a practitioner page template so my client can easily add new practitioners to her website. To further make her life even easier, all the questions are in a Google Form, that she can email to a new practitioner to fill out. All she has to do is copy/paste the information into the template – what saves her time, also saves her money. Before, each page had no title to indicate what page was being viewed (aside from the navigation bar highlight). After, each page has a clear and consistent title, providing the visitor more information about what they are viewing. The new DeHart Bodywork website now provides a consistent content structure and layout for easy navigation and wayfinding; it utilizing whitespace, bullets, and chunking for better scalability and content digestion; and is structured in a way that allows my client to easily and efficiently update. My client has a better understanding of her customer's needs. The before and after comparison of the DeHart Bodywork homepage. I enjoyed working with my client and empathizing with her businesses mission. 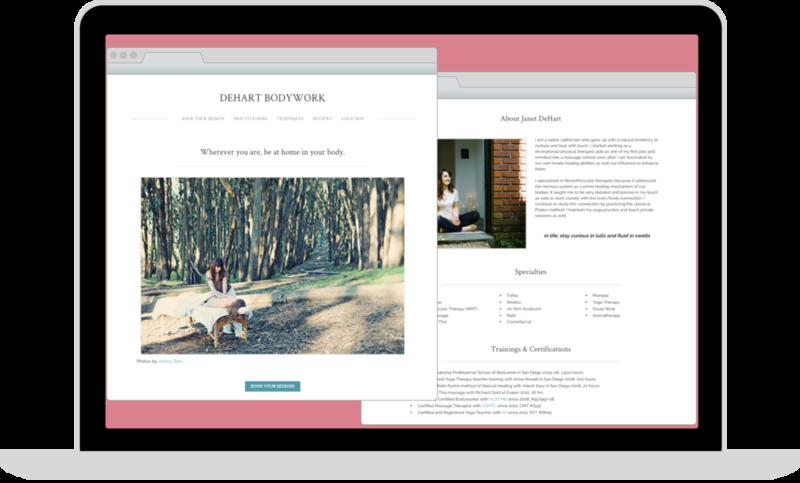 Empowering my client to be able to easily and quickly update her business' website on her own is a long-term benefit to her company. If this project were to go on longer, I would work with my client to interview some of her key customers, to get a better understanding about their motivations for massage. There might be larger questions around one's beliefs about holistic health or alternative therapies in general that might better explain motivations and provide more clarity about the results we received in the survey, and in turn better help my client connect with her customers.